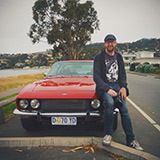 Australian Jensen Forums • View topic - Picked up from shipper! Just picked up FF 253 from the shipper today. Chewed up 20 litres of fuel from Botany to Bankstown! Re: Picked up from shipper! Google maps says Botany to Bankstown is only about 20km. 1km per litre? 100l/ 100km? That does not sound right, what do you think is causing that? I just realised I only stuck around 10 litres in the car and I went via a weighbridge so I did a few K's.